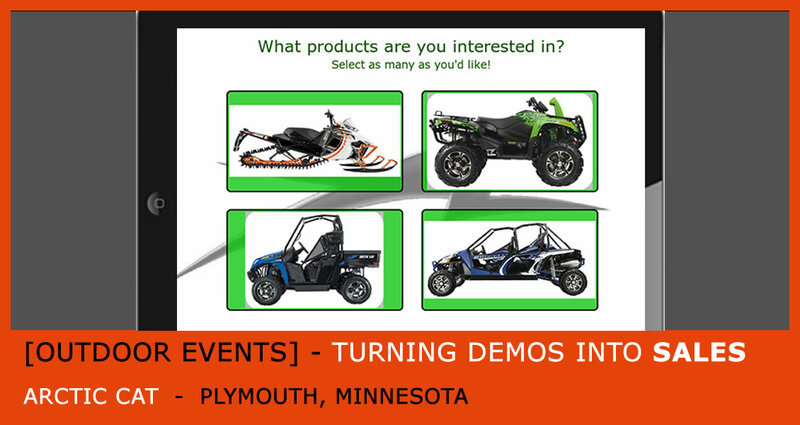 Arctic Cat, manufacturer of snowmobiles, ATVs and side by sides offers Demo Rides to potential buyers at outdoor events nationwide. Due to the remote event locations, they needed an OFFLINE, PAPERLESS system for capturing customer preferences, waiver agreements and email opt-ins. Rider data would then be pushed to Salesforce and forwarded to the nearest dealer for immediate follow up so they can close the sale. Passing customer product preference directly to the local dealer offered them the perfect way to follow up. Reaching out with relevant product information drastically shortened the sales cycle. Offering attractive, descriptive images as answers greatly enhanced the UI for riders and brand recognition for Arctic Cat. No internet? No paper? No problem! Arctic Cat machines cannot be tested in a nice, clean showroom. Wilderness is required. iCapture’s software eliminates the need for Wifi and paper forms, making remote data capture a breeze. iCapture safely stored data on the iPads until the crews got back to the office and reconnected to the internet. Then, iCapture pushed it directly to Salesforce. No paper or double handling of data required.